How often in life do you realize something in your life has to change. As a amateur radio operator for several years, the accumulation of equipment, cables, and antennas has led to a hodgepodge of untenable solutions to make my ham shack presentable. It’s not about making it work or having a better station, but now, it’s about making it look presentable as part of my home. Some amateur radio operators have stations either as part of their home or separate from the house in places such as a garage or a basement. As radio operators, we all have differing preferences as to our operating environments. In my case, as mentioned earlier, my operating environment is my home office. 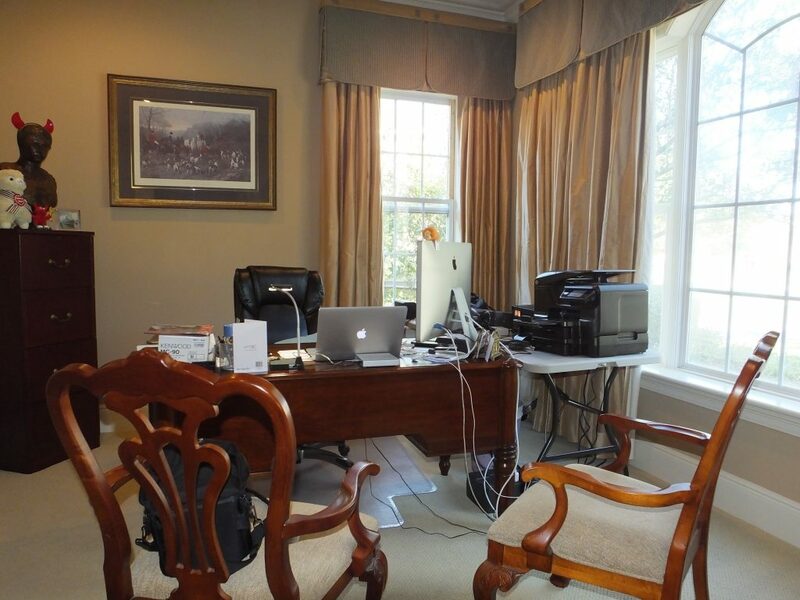 As you enter my home, my office is immediately to the right, viewable to all who enter. Of course, now I close the set of pocket doors to shield the unruly mess from my guests. 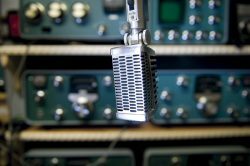 As an ambassador of amateur radio and at this time in my life, I want my ham shack to be a showcase and not just a man cave of eclectic amateur radio gear and assorted electronic equipment. But there is a second goal to this project which is to include a space for my wife to take care of her business such as paying bills, research, and record keeping. Currently, she is utilizing counter space in the kitchen to perform these tasks. Having a space within my home office which she can operate her radio could also facilitate me with my experimental radio projects since my wife is a licensed amateur radio operator – KG5OGO. After searching the internet for solutions, I came across several commonalities associated with ham shack desks. First and foremost, any desk, shelf or piece of furniture must be capable of holding significant weight. Amateur Radio Equipment is heavy, very heavy. Secondly, shelving and desk depth are important since inevitably as ham operators will purchase more equipment whether or not we truly need it or not. Third, most ham station furniture is makeshift furniture or modified furniture to make is suitable for amateur radio operations, and hence, not very attractive but very usable most of the time. And lastly, all the internet searching yielded little with respect to integrating the functions of a home office with the functions of an amateur radio station. I still need my home office to get work done that pays the bills and supports my family. In my efforts to find a solution, I came across a few forum posts in various amateur radio forums which mentioned a company called Winsted which makes control room consoles. 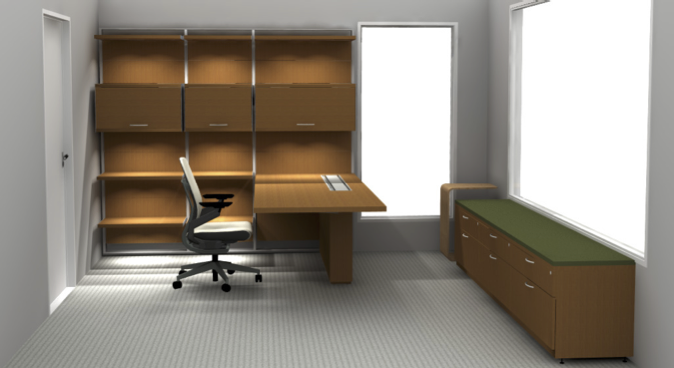 Although their Encompass-2 Workstation consoles looked like it might fit the bill, I really was looking for a complete solution for my home office to include storage spaces such as closet space and shelving. Although I’m sure Winsted could design and custom build a solution for my home office, it appears their true expertise is building out control and corporate spaces. Frustrated by the lack of solutions to my ham desk project, I decided to look at the offerings from Steelcase. 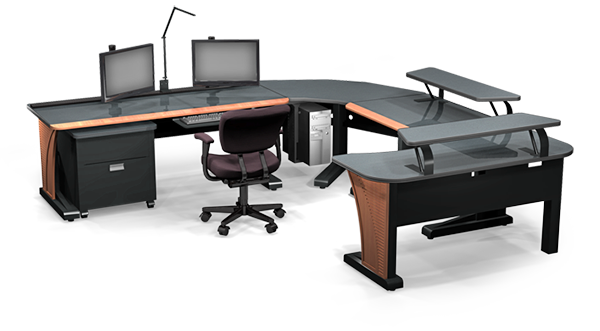 The only reason I wanted to look at a Steelcase solution for my home office is due to my familiarity with their products at our main office building. Also, the local dealer in the New Orleans area for Steelcase is Workplace Solutions which provides consulting and design services which is a huge plus. Initially, I was hesitant to engage Workplace Solutions to assist me since I assumed my interest in merging my amateur radio interest with the functions of my home office might fall outside the scope of their normal business. After realizing the time had come to bring aboard professional help to design a solution, I decided to call Workplace Solutions for a consultation. Shorty after, I received a call from Martha Sue, an Account Manager with Workplace Solutions. After some initial discussion on my ideas with respect to integrating my amateur radio interests into my home office, we set a date with Martha Sue for an onsite evaluation. 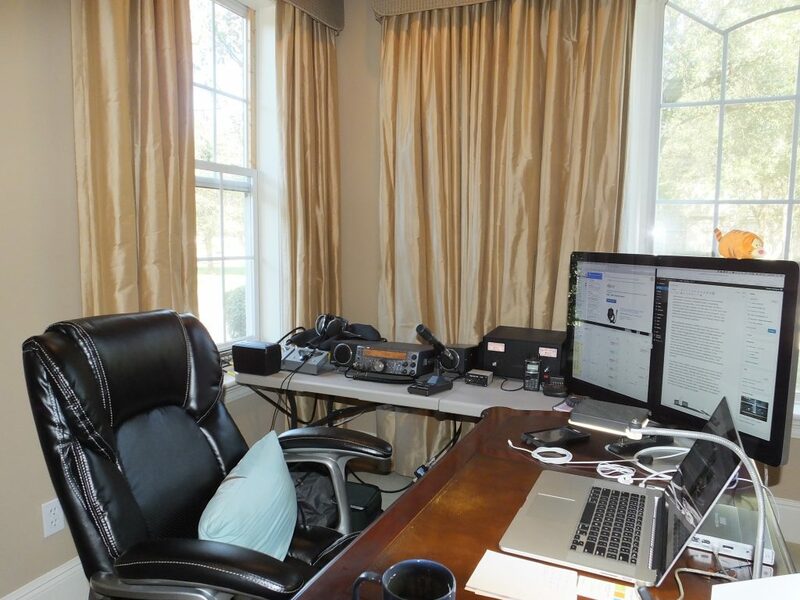 On the day of our onsite survey, Martha Sue and an associate arrived on time and were fascinated by amateur radio and my desire to integrate it into my home office. During our conversations, high priority was given to furniture strength, cable management, work flow design, file space, book shelving, and equipment layout. The proposed layout will accommodate all normal office functions as well as accommodate my amateur radio interest and experimentation. The furniture is from the SteelCase FlexFrame Line. FlexFrame was chosen particular for hiding the enormous amount of wire, connectors, and power cords. Additionally, the shelving is very strong and can accommodate 100 lbs. per shelf. All required now is choosing the finishes of the furniture and cushions. I just wanted to thank Martha Sue and all the personnel at Work Place Solutions who worked on developing the proposed layout. At this point, the furniture is ordered and awaiting delivery. Part II of this post will focus on the installation of the furniture and the reorientation of my amateur radio station so stay tuned! We are happy that you chose us to help. Can’t wait to see how it turns out. I can’t wait to see the final product as well! I’m sure it will exceed my expectations. The furniture is arriving daily. Installation day is on the horizon. So excited!